Peter Laroche pitched in as part of the Opportunity Crew program in Portland, Maine. Participants work two days a week. 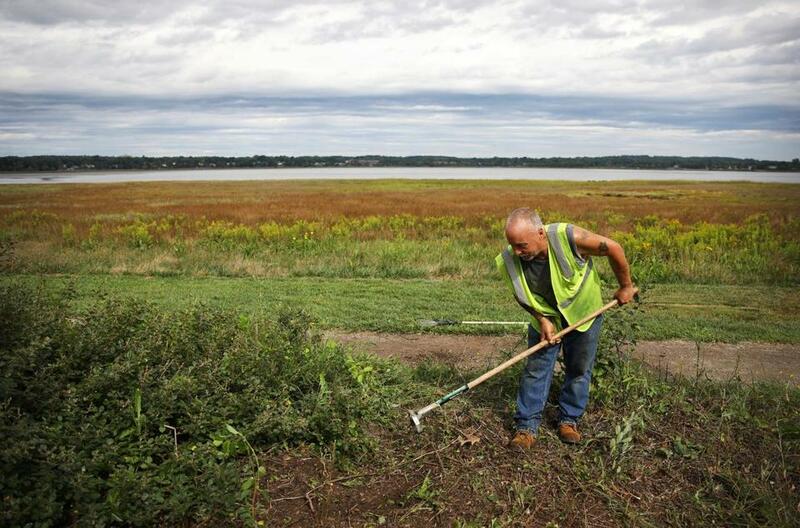 PORTLAND, Maine — Seven men, stooped and sweating, tear fistfuls of crabgrass and milkweed from a tangle of overgrowth in a large public garden. 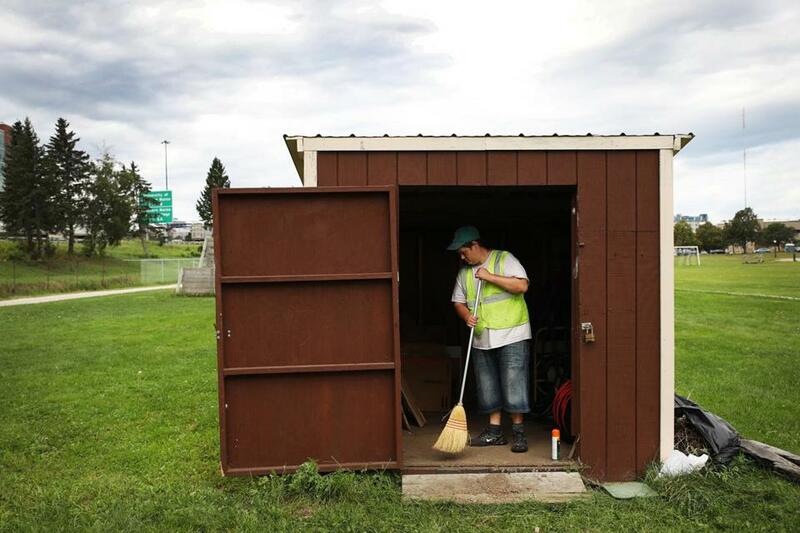 It’s dirty work for $10.90 an hour, the minimum wage in Maine’s largest city, but there’s not a complaint to be heard. It’s also a dramatic change from how these men usually spent their days — standing in median strips, holding a panhandler’s sign, begging from motorists who are just as apt to curse as hand over a dollar. But now, Portland officials are inviting panhandlers to put away their signs and put on a pair of work gloves. They clean parks, beautify public gardens, and even place flags at the graves of veterans in exchange for a small paycheck and a possible path to better, lasting employment. Portland’s program, nearing the end of its second year, is not intended to erase panhandling, city officials say. Some men and women who “fly their signs” at Portland intersections, most of them homeless and desperate for money, will never be persuaded to put them away. But it’s an effort that passes legal muster. Both Portland and Worcester, Mass., for example, had banned panhandling with ordinances that were overturned by federal courts, which ruled that they infringed on free speech. Portland’s new approach is all carrot and no stick. Panhandlers are pitched on the program as a way to leave the streets, connect with benefits such as housing vouchers and food stamps, and find work in the future through a day-labor agency that partners with the city. Participation is voluntary — workers can drop out of the Opportunity Crew program at any time. But so far, no one has been asked to leave for failing to do the job or follow the rules. The Opportunity Crew has a budget of only $40,000 per year, but the benefits go far beyond dollars and cents, city officials said. Through last week, 281 bags of trash had been collected this year and 121 syringes removed from public spaces, said Aaron Geyer, who supervises the program. A total of 936 hours had been logged by crews of 6 to 10 people who work Wednesdays and Thursdays from April until October. “They show up on time in the morning, and they’re ready to work,” Geyer said. The cost of a crew is pegged at $1,300 per week, and business sponsors that help pay for the program are promoted on city signs at the cleanup sites. The Opportunity Crew is modeled on an Albuquerque program that a Portland resident brought to Jennings’s attention. After a pilot trial in 2017, Portland put up the funding to carry it forward this year. So far, 17 men and women have found jobs after participating in the Portland program, which Jennings said he hopes to expand. “It’s a really constructive approach to the issue of homelessness, which at its core is the underlying issue of panhandling,” Tars said. The Opportunity Crew attracted Richard Cox, a 54-year-old former fisherman who said the program gives him dignity as well as a few dollars, which the crew receives by check after each shift. Matt Pryor, the program’s day-to-day manager, experienced the backlash firsthand when he approached panhandlers on the streets to pitch the Opportunity Crew. “I had people rolling down the window and yelling, ‘Get a job,’ ” Pryor said. Cox, a Cambridge native, said his problems began after he broke his back in 1994, when he still fished for a living. Opiate painkillers helped his mobility, but they also led to dependence that Cox said he didn’t leave behind until four years ago. He continues to live at a homeless shelter while he works with the Opportunity Crew. But Cox now has structure and purpose, at least twice a week, and he has a little more money coming in. “I put it away, or I spend it on my grandkids,” Cox said. That’s a sentiment shared by Frank Mello, who gives each of his teenage daughters $40 a week from his Opportunity Crew earnings. The children’s mother died three months ago from a heroin overdose, he said. “Basically, I’m working for my children. They need me right now,” Mello said in a gravelly voice, straightening up as sweat poured from his face. He looked around, glancing at the others as they weeded and raked in near-silence, stopping only occasionally for brief breaks. 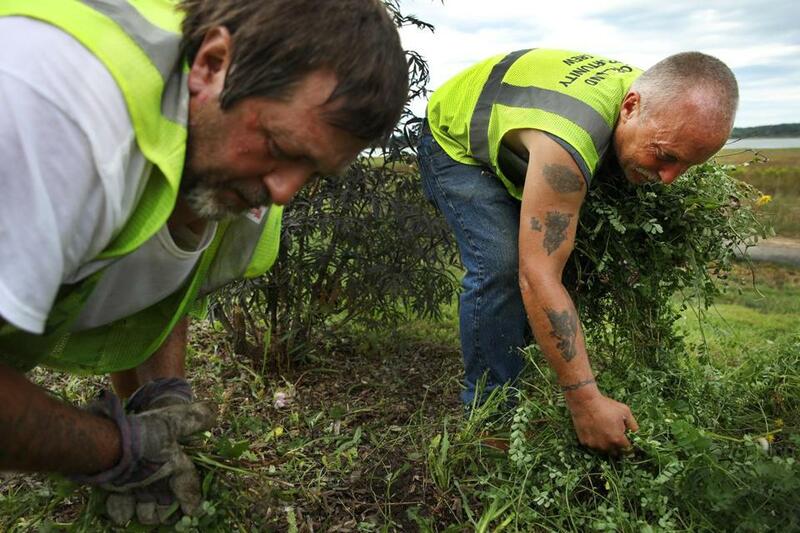 Frank Mello (left) and Richard Cox cleaned up gardens along the Back Cove Trail.